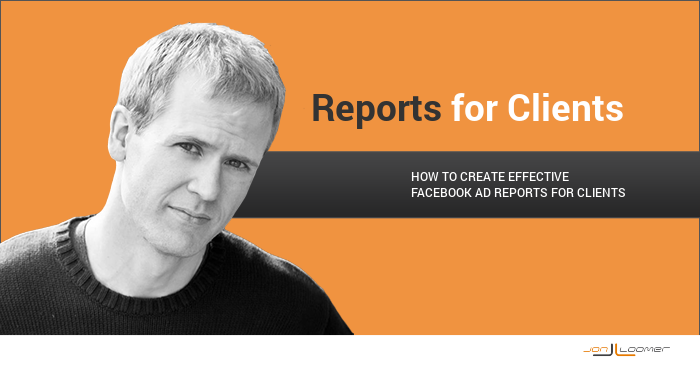 One of the main struggles that my readers face as consultants is crafting effective Facebook advertising reports that they can send to their clients. Luckily, Facebook has a powerful, customizable reporting system available. Unfortunately, the vast majority of advertisers don’t use it. 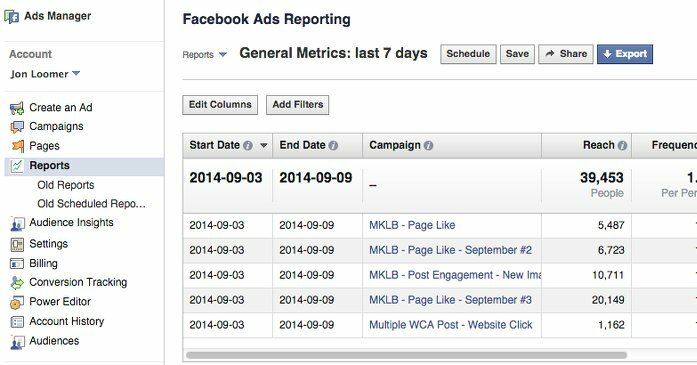 If you aren’t using Facebook’s custom ad reports, you aren’t the only one. But it’s now been available for well over a year, and you’re running out of excuses! 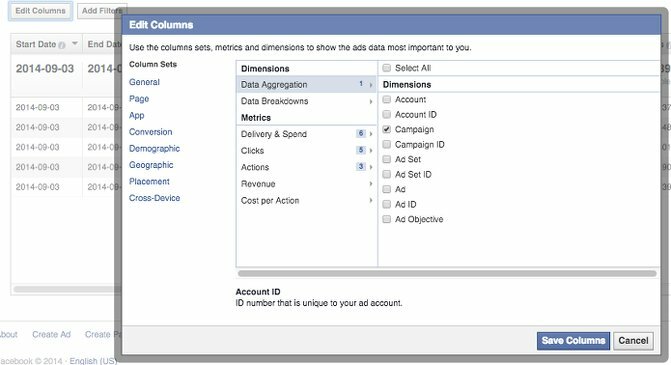 If you manage your campaigns from the Ads Manager, you very likely use the standard reporting interface to view how you are doing on a campaign, ad set or ad basis. But you only get the stats that Facebook gives you. What you want is something more customized! This report has 17 columns and isn’t particularly useful. But you can customize it by clicking the “Edit Columns” button. Most clients don’t know what they want in a report. Or they act like they do and ask for everything. You need to set expectations and provide structure. Don’t allow them to be distracted by metrics that don’t matter. Create concise reports that are focused on a clear objective. I recommend only sending reports at the end of each month. Things change quickly. Don’t allow the client to overreact while you are testing early in the process. Of course, if you’re running campaigns for mobile app installs, for example, you’ll want to run that report as well. It all depends on the work you are providing. Before we get started with creating these reports, it’s important that you follow a very important step. It’s critical that you have an effective naming convention for your campaigns. The page name and objective will be important for filtering. 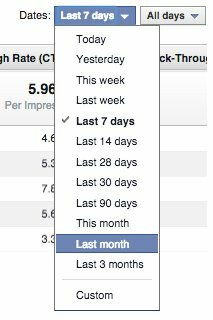 I include the month for recurring campaigns (I always keep a Page Likes campaign running). This is a basic report that should be run for most clients. It should capture the performance of all ads run for the sole purpose of increasing Page Likes. This report includes several metrics that marketers are in love with. Some are much less important than their reputation. And they simply aren’t necessary here. While you can break it down by ad set or ad within “Data Aggregation,” I recommend you don’t. All the client needs to know is how efficiently your Page Likes campaign is building Page Likes. Your current report will now include all of the campaigns you ran last month. 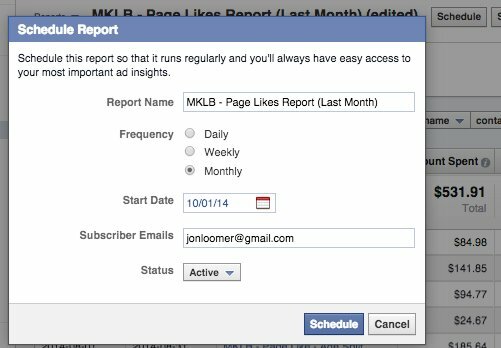 Now you’ll need to add a filter or several filters to only pull in the Page Likes campaigns for a specific client. You can move the columns so that stats are in the order you prefer by grabbing the top row of a column and dragging it over. Next, save this report for access later by clicking the “Save” button. Make sure the name of that report is descriptive. Note that this saved report is now available within the top left drop-down. Whether you boost a post through your page or promote it within the main ads interface or Power Editor (PREFERRED! ), you should run a report that highlights these efforts. Your goal here is typically to get some sort of post engagement (comment, post like, share). Don’t forget to change the dates to “Last Month” and save your report. This is separate from the Post Engagement Reports for a reason. When you share a link, general post engagement is nice, but it’s not the objective. Your focus is on driving website traffic. 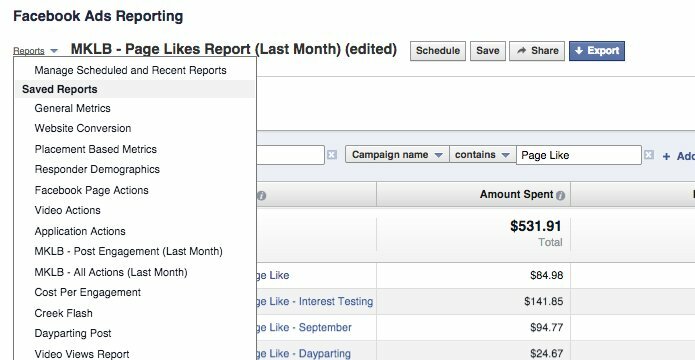 This report will only work if you use conversion tracking so that Facebook can report on the number of conversions your campaigns are generating (one of the many reasons to use Conversion tracking!). If you used multiple conversion types, you can choose those as well. Just be careful not to make this more complicated than is necessary. Finally, you can create a master report that captures more data, just in case. This would be in the event that a client wants to know how many total page likes your campaigns generated, for example (including those that had objectives that weren’t for page likes). Note that we don’t use Cost Per Action here since the results will be watered down and will appear worse than they are. Make sure to filter by Page Name only. Finally, let’s schedule these reports to be sent to both you and your client! Next you’ll want to select “Monthly” for the frequency and pick a start date that is the first of the next month. Finally, enter all email address of the people who need to receive that report. They’ll be emailed links to the export as well as the page for the report (they will need to have access to that page). I didn’t cover every objective above (Photo Views, Video Views, Mobile App Installs, Event RSVP, Offer Claims, etc. ), but you get the picture. How do you handle reports for your clients?